The genomic material needs to be precisely organized and access to its information carefully regulated in order to ensure proper functioning of a cell. These instructions are encoded in the DNA, although not in the form of the well-known three-letter words (or codons) that chemically code for proteins. 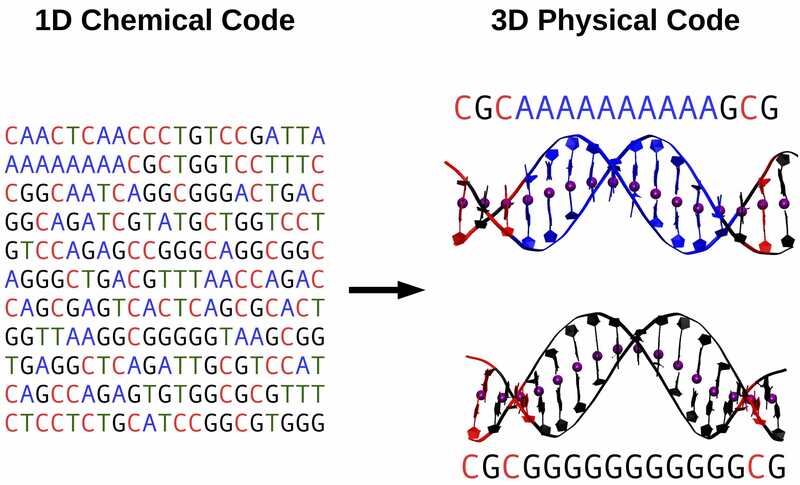 In this work we found a striking connection between DNA sequence, structure and flexibility: the sequence can specifically modify the flexibility by means of concerted changes in the structure of the double-helix. In order to explore this problem, we performed state--of--the--art computer simulations with atomistic detail of several DNA molecules of different sequences. In our simulations we made use of a protocol that we have previously developed and which allows to incorporate an external force that acts to elongate the DNA (and any other system) in a controlled manner. In this way, one can obtain accurate measurements of the "spring constant" -- or stretch modulus -- of the system under study. Our computer simulations showed that DNA molecules with different sequences substantially differed in their extension. This was a consequence of an internal curvature of the DNA that we denoted crookedness. This curvature is apparent if we represent the centers of the base pairs [color beads in Fig. 2(a). As we increased the force, sequences that were initially more compressed -- or more crooked -- were able to elongate by a greater amount that those that were already elongated at low forces. Crookedness works as a reservoir of elastic energy that is directly encoded in the nucleotide sequence. Remarkably, sequences that lacked this reservoir had been previously described to destabilize nucleosomes, the first step of DNA compaction into chromosomes. As a consequence, these DNA regions are known to be highly accessible to the cellular machinery, triggering many key biological processes. Our results support the idea that is the physical code that defines these regions. 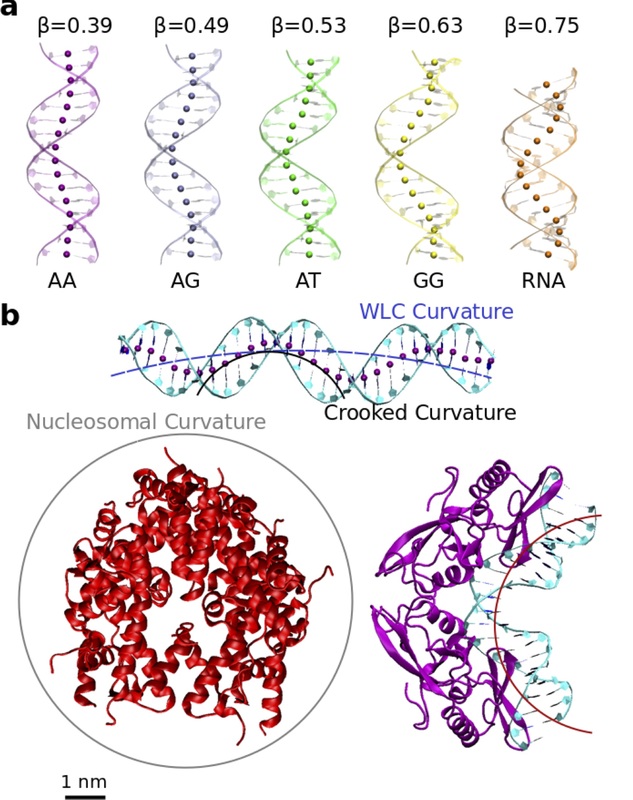 In other words, it is the unusual rigidity of these sequences, mediated by the crookedness, that confers them the ability to preclude their compaction into nucleosomes. This insight opens up many fundamental questions: How does this stretching flexibility relate to other forms of flexibility, such as twisting or bending? How is the crookedness involved in deformations at longer length scales? And more importantly, how is this physical code regulated at the genomic scale?. The answers, that we are currently exploring, will help to reveal how cells make use of this physical code to neatly organize their huge amount of genetic information. Fig. 1. Our MD simulations reveal a striking connection between DNA sequence, structure and flexibility at short length scales: the sequence can specifically modify the flexibility by means of concerted changes in the structure of the double-helix. Fig. 2. Representation of DNA crookedness. (a) Average structures and computed β values (in rads) over 1 µs--long MD simulation at 1 pN force of the sequences CGCG(NN)5CGCG with NN=AA, AC, AT, and GG. The beads represent the centers of the base pairs. The terminal base pairs have been omitted. (b) Top: average structure over 250 ns MD of a 30 bps poly-G DNA molecule. The solid black line represents the crookedness curvature and the dashed blue line an estimation of the curvature predicted by the Worm-like-chain (WLC) model. Bottom: examples of highly curved DNA when bound to proteins. (left) Histone octamer (PDB ID: 1AOI), where the histone tails have been removed for clarity. A grey circle of radius 41.8 Å represents the trajectory of nucleosomal DNA. (right) Crystal structure of the homing endonuclease I-PpoI DNA complex (PDB ID: 1A73), with an estimation of the DNA curvature represented by the solid red line.